Description: CR SD40-2 6416, U25B 2588, and GP38-2 8043 join the 20-cylinder power at Pitcairn. Description: Eastbound on the former PRR right of way. Description: A CR w/b rounds the curve at Newark near Oak Island yard as P92 shows Approach on track 2 on 29JAN1983. A SD40 and SD40-2 provide the pulling power on this winter day. Description: That was the way it always happened, even if it stabbed the D&H. In this case, CR is doing it right, as the northbound coming out of the yard will take a while to clear BD and the speed restricted curve going up to Bevier St. OIBU passes BD and will quickly be working the yard while PYRP takes its time. Description: OIBU rolls onto the double track at CP Coles, known as DH on the Erie Lackawanna, and will take track 1 into Binghamton, where it will drop and pick up before heading west. The half dozen R 32's behind the power will go to Elmira Heights for rebuild at Sumirail. 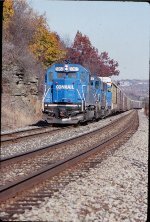 Description: DABU approaches Owego along NY 17C in fading fall color behind an SD40 rebuild. 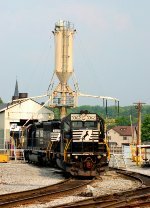 Description: 6416 leas an eastbound past the museum at Coneaut, OH.